As I'm getting closer to WASP v1.0 release, I have started to work with some of my clients to put the tool to the test. So here's first real life case study of WASP! Quebecor is one of Canada's largest media companies. More specifically, Quebecor Media Inc. encompasses nearly 200 websites with very diversified ebusiness requirements, strategies, and technologies. In terms of web analytics, it's what I would call a "nice playground", with sites ranging from multilingual media portals to bookstore, dating, classifieds, jobs, search, etc. 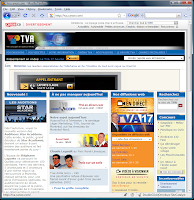 This case study looks more closely at tva.canoe.com, a (French) TV channel website with information about shows, schedule, artists, contests, live and on demand video, etc. QMI took the right approach of defining guidelines and requirements for their SiteCatalyst implementation. This way, a common baseline is shared across all sites, easing deployment across various business units (despite different technologies and different development teams), standardizing the terminology and aggregating traffic into roll up accounts. Although most sites are template driven (CMS, eCommerce catalogues, etc. ), there are always certain pages that needs to be tagged in a more manual way. This is often the case for transactions: subscriptions, checkouts, etc. But with dozens of templates, some of them might be missing tags or using the wrong version of the implementation code. Unspecified hierarchy: If some pages do not set the hierarchy variable (hier1) to its full extent, all those page views are summed up into "Unspecified" so the total of pages views at that level match up with the total shown at the level above. It took WASP less than 15 minutes to crawl the first 1,000 pages of that site section. 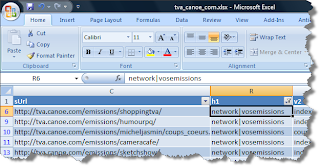 By using the WASP "Save as CSV (Comma delimited)" option and filtering on the Hierarchy column (h1) for pages with only "network|vosemissions", we were able to identify a couple of pages that didn't have the 3rd hierarchy level. Templates such as artists bios and specific show episodes were using an earlier version of the implementation code. That's what it's all about: making it easier to do quality assurance of your web analytics implementation.